The Dementia Scotland 2016 Conference focused on the progress of Scotland’s ongoing National Dementia Strategy, whilst also examining the aspirations of the new 2016-2019 strategy. Director Irene Oldfather presented at the morning plenary session about a human rights based approach to Dementia Care, discussing the Charter of Rights for People with Dementia and their Carers, and how to embed and implement a rights based approach. 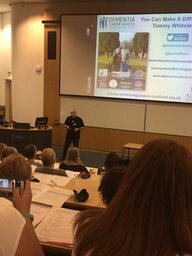 Project Engagement Lead Tommy Whitelaw was invited to give the keynote address at the Admiral Nurses Forum, whose theme this year was ‘Creative Approaches in Dementia Care.’ Approximately 170- 180 Admiral Nurses attended, and it was a great opportunity for the project to share its work and promote the voice of lived experience. You can read more about the day in our blog post and see the tweets from the day in this storify. It was an honour for the team when Project Engagement Lead Tommy Whitelaw was nominated as a finalist in the Individual category of the Kate Granger Awards 2016. Now in their third year, the awards were set up by Kate Granger, a doctor who worked tirelessly to raise awareness around compassion in the NHS through her #hellomynameis social media campaign. There were more than 130 nominations for this year’s awards, and we’d like to thank Joan, a transformation nurse, for taking the time to nominate Project Engagement Lead Tommy. Read more awards in our blog post. Our You Can Make a Difference Campaign, has worked with the University of West of Scotland several times and we have always been inspired by the response of students. This occasion was no different, and it was great to hold parallel sessions with Cath Cooney, ALLIANCE House of Care Programme Manager, and Susan Donnelly and David Marshall, Health Improvement Advisers from the Care Inspectorate. You can read more about the talks here as well as reading the pledges made my students. Alzheimer Scotland has opened their new Dementia Resource Centre and Day Centre in the heart of the community at Bridgeton Cross. The centre is for people affected by dementia and their carers, friends and family members to access information, support and advice. Labour’s Health Spokesman. Director Irene Oldfather updated Anas Sarwar MSP about the progress of the ALLIANCE and looking ahead to 2017. We will continue to work closely with members of Scottish Parliament to ensure that the voice of lived experience is at forefront of all Scottish health and social care policy. Did you know that unpaid and family carers of someone with dementia can access free membership at both the Health and Social Care Alliance Scotland (the ALLIANCE) and Alzheimer Scotland? Find out more different ways to have your voice heard. The European Economic and Social Committee (EESC) are looking to hear your views on the issues addressed in the European Commission’s communication for a European Pillar of Social Rights, at a seminar on 2 November, in Glasgow 1-5pm. For more information and to register for your place click here. Do you support or look after someone with dementia? If so, researchers at the University of Glasgow would like to hear your views. A £10 gift voucher would be offered to participants and travel expenses would also be refunded. If you are interested and would like more information please contact Kathryn Saunderson: email Kathryn.saunderson@gla.ac.uk , phone 0141 330 8322. SPRCN are looking for enthusiastic volunteers to help improve research into primary care. Do you have good ideas on what can really benefit people accessing services and support? Find out more here. Researchers from the University of Glasgow Institute of Health and Wellbeing are working in partnership with the Health and Social Care Alliance Scotland to recruit a small team of Volunteer Peer Researchers. We are looking for people with lived experience of long term conditions, or with experience of caring for someone with a long term condition, who have an interest in health research. Find out more here. A See Me Community Champion is currently running a survey to factors that may enable or prevent students from speaking openly about mental health issues, and periods of distress, and seeking support while at University. The results of the survey will be used to inform Disability Support Services at University of Strathclyde and elsewhere. The survey is open to anyone currently studying at university. All information will remain anonymous. For a chance to win a £50 Love2shop voucher after completion, email benjamin.mcelwee@seemescotland.org to be entered into a random draw. A new training film has been launched in collaboration with Dementia Carer Voices and Broomfield Hospital to be used as part of the hospital’s induction process.